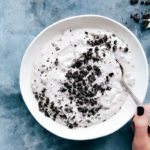 A delicious and protein-filled cookies and cream dip with only FOUR ingredients! In a large bowl, add the cookies and cream protein shake and the milk. Slowly add in the pudding mix while whisking constantly. Whisk for 2-3 minutes. Add in the thawed whipped topping and fold to combine. Don't overmix. Cover the mixture tightly and place in the fridge for at least an hour and for best results, overnight. When ready to serve, crush the cookies or give them a coarse chop and stir them into the mix (don't add crushed cookies to anything you'll have leftover or they get soggy!). Serve the dip with fresh fruit and enjoy!